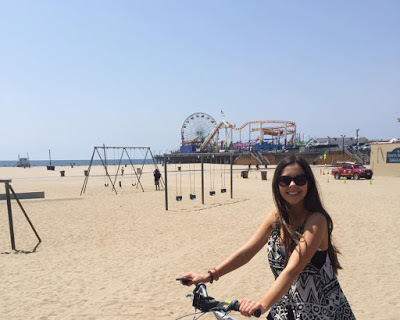 Riding a bicycle down a palm tree lined beach under a flawless blue sky... That is pretty much the image that would pop into my mind whenever I would here the letters L.A.
That dream became a reality as Kristina and I cycled from Santa Monica to Venice Beach. 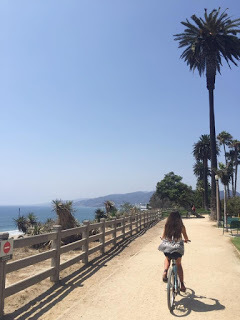 We cycled through Santa Monica, past the iconic pier and down the Marvin Braude Bike Trail as I caught up with my dear kiwi friend who has recently become an Angelino. 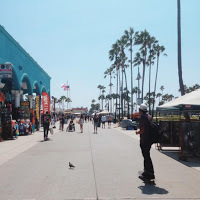 Venice Beach... It is funky, eccelctic, and a little bit weird, and I absolutely LOVE it. You will see anything and everything here; from bulked-up gym junkies to street performers to stoners.